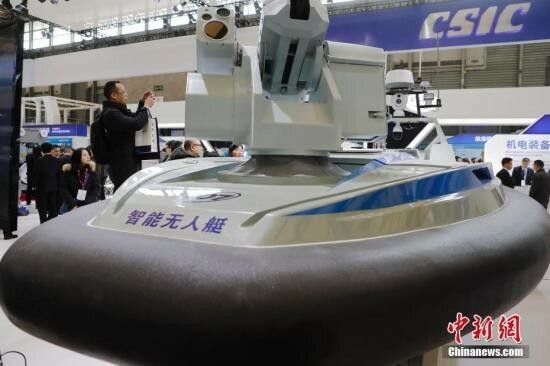 The world's fastest Chinese-developed unmanned surface vehicle (USV), the "Tianxing-1," was unveiled at the fifth China Marine Economy Expo in Zhanjiang, Guangdong Province on Thursday, Chinanews.com reported. Jointly researched and developed by Harbin Engineering University and Shenzhen HiSiBi Boats Company, the production of the USV was completed in September this year. With a top speed over 50 knots (92.6 km/h), the USV is electric-gasoline hybrid with a length of 12.2 meters and a full displacement of 7.5 tons. "The USV can be used in maritime law enforcement and as an addition to navy manpower. It also can be used in dangerous situations," said Huang Zhuo from HiSiBi Boats Company, the largest manufacturer of speedboats in China. "Previously, the world's fastest USV was part of the British military, with a top speed of 50 knots. However, this Chinese-made one has overtaken it and become the fastest," Huang added. "Some manned speedboats can reach up to 70 knots in speed but need to be controlled by experienced drivers as heavy storms and obstacles may increase the risk of danger. This is also a challenge the USV faces," Huang added.